VGP19T Features: -Fast Release is 2x easier to open, has a no-pinch release, and offers more finger room. 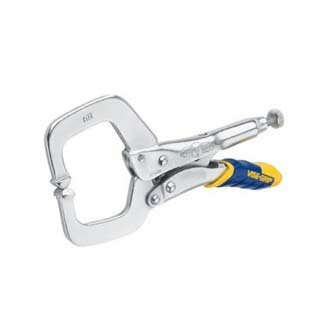 -Wide opening jaws provide greater versatility in clamping a variety of shapes. -Turn screw to adjust pressure and fit work; stays adjusted for repetitive use. -11R Fast Release Locking Clamp with Regular Tips. Pliers: -Locking Pliers. Quantity: -Single. Product Type: -Clamps. Dimensions: Overall Length - Top to Bottom: -13.31 Inches. Overall Width - Side to Side: -5.94 Inches. Overall Thickness: -1.06 Inches. Overall Product Weight: -1.8 Pounds. If you have any questions about this product by Vise-Grip, contact us by completing and submitting the form below. If you are looking for a specif part number, please include it with your message. XiKe 10 Pack 606ZZ Precision Bearings 6x17x6mm, Rotate Quiet High Speed and Durable, Double Shield and Pre-Lubricated, Deep Groove Ball Bearings. XiKe 10 Pack 6004ZZ Bearings 20x42x12mm, Stable Performance, Cost-Effective, Double Shield and Pre-Lubricated, Deep Groove Ball Bearings. XiKe 10 Pack 629ZZ Precision Bearings 9x26x8mm, Rotate Quiet High Speed and Durable, Double Shield and Pre-Lubricated, Deep Groove Ball Bearings. XiKe 10 Pack 6002ZZ Precision Bearings 15x32x9mm, Rotate Quiet High Speed and Durable, Double Shield and Pre-Lubricated, Deep Groove Ball Bearings. XiKe 10 Pack 6002-2RS Precision Bearings 15x32x9mm, Rotate Quiet High Speed and Durable, Double Seal and Pre-Lubricated, Deep Groove Ball Bearings. XiKe 10 Pack 6001ZZ Precision Bearings 12x28x8mm, Rotate Quiet High Speed and Durable, Double Shield and Pre-Lubricated, Deep Groove Ball Bearings. XiKe 10 Pack 609-2RS Bearings 9x24x7mm, Stable Performance and Cost-Effective, Double Seal and Pre-Lubricated, Deep Groove Ball Bearings.